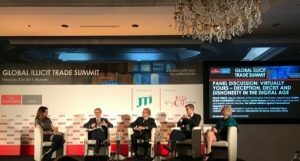 The Global Initiative against Transnational Organized Crime joined the Economist Global Summit on Illicit Trade on 21st February 2017 in Brussels. The summit was the inaugural meeting of stakeholders to explore how pharmaceuticals, luxury brand products, consumer electronics, excisable goods, and fast moving consumer goods are affected by counterfeiting and illicit trade and what needs to be done to protect society, uphold the rule of law and ensure strong enforcement of global supply chains. The need for a global, multilateral response to a crime perpetrated by transnational organized crime groups which see borders and opportunities not threats. Robin Cartwright of the Global Initiative Private Sector Working Group was a keynote speaker on the Virtually Yours: Deception, Deceit and Dishonesty in the Digial Age panel discussion. The panel considered the rise in technology as both an enabler of illicit trade and a route to tackling it in a well received final session. In particular Robin focused upon the vital need for any one crime, in this case illicit trade, to be considered as part of the wider transnational organized crime pantheon of activity, not as a standalone issue if it is to be successfully addressed. These will be among the themes developed further in the Research Paper: “Transnational Organised Crime and the Impact on the Private Sector: victims, facilitators or unsung heroes?” due to be published by GI-TOC in April 2017.